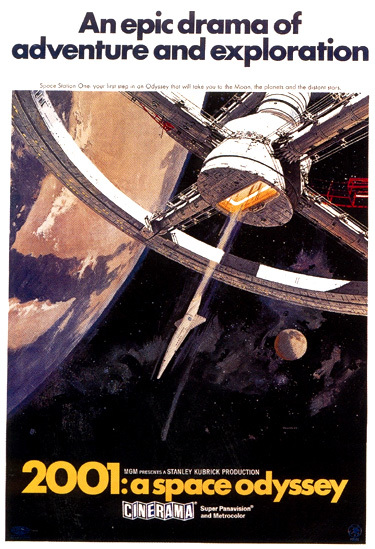 2001: A Space Odyssey (1968) is a landmark, science fiction classic - and probably the best science-fiction film of all time about exploration of the unknown. It was released, coincidentally, at the height of the space race between the USSR and the US. It appeared at the same time as NASA's exploratory Apollo Project with manned Earth orbiting missions - a prelude to orbiting and landing on the Moon with Apollo 11 on July 20, 1969. And it prophetically showed the enduring influence that computers would have in our daily lives. Director Stanley Kubrick's work is a profound, visionary and astounding film (a mysterious Rorschach film-blot) and a tremendous visual experience. This epic film contained more spectacular imagery (about what space looked like) and special effects than verbal dialogue. Viewers are left to experience the non-verbal, mystical vastness of the film, and to subjectively reach into their own subconscious and into the film's pure imagery to speculate about its meaning. Many consider the masterpiece bewildering, boring, slow-moving or annoying, but are still inspired by its story of how man is dwarfed by technology and space. The first spoken word is almost a half hour into the film, and there's less than 40 minutes of dialogue in the entire film. Much of the film is in dead silence (accurately depicting the absence of sound in space), or with the sound of human breathing within a spacesuit. Kubrick's sci-fi experiment intended to present its story almost purely with visual imagery and auditory signals with very little communicative human dialogue (similar to what was attempted in the surreal, fragmented, non-narrative imagery of the Qatsi trilogy - from 1983-2002, from Godfrey Reggio). All scenes in the film have either dialogue or music (or silence), but never both together. The breathtaking, richly eloquent, and visually-poetic film - deliberately filmed at a slow pace - about space travel and the discovery of extra-terrestrial intelligence (many years before Star Wars (1977), Close Encounters of the Third Kind (1977), and E.T. : The Extra-Terrestrial (1982)), was based on the published 1951 short story The Sentinel, written in 1948 by English science fiction author Arthur C. Clarke. Its original screenplay was co-authored by director Stanley Kubrick and Clarke from an expanded novelization, and the film was originally titled Journey Beyond the Stars. The film's title was chosen because it was the first year of the new Millenium and of the next century. The film was also strongly influenced by director George Pal's Conquest of Space (1955), and was similar in some plot elements that were referenced by Kubrick. Three months after the film made its debut, Clarke published a novel based upon the film's screenplay. Kubrick's masterpiece was not nominated for Best Picture, but received four Academy Award nominations, including Best Director, Best Art Direction, and Best Original Story and Screenplay. It won one Oscar, for Best Visual Effects. The film was snubbed by the Academy that instead voted its top accolades to the odd musical Oliver! (1968) based upon the Charles Dickens tale. [Note: In the same year, Planet of the Apes (1968) was given a Special Honorary Oscar for John Chambers' outstanding, convincing makeup (there was no Best Makeup category until 1981) - the Academy members presumably didn't realize the superior, too-believable makeup in the opening scenes of 2001 that included both human actors with life-like masks and infant chimpanzees.] Douglas Trumbull, the Special Photographic Effects Supervisor, went on to work on Close Encounters of the Third Kind (1977) and Star Trek: The Motion Picture (1979). The film initially opened to hostile, unsympathetic, negative or indifferent critical reviews (it was criticized for being boring and lacking in imagination), and 19 minutes were cut from the film after premieres in Washington, New York, and Los Angeles. But it slowly gained enormous popularity during yearly re-releases, especially when embraced by late 1960s counter-cultural audiences for its psychedelic, mystical and mind-bending elements. It was re-released in a slightly shorter version (141 minutes) in 1972. A sequel was made years later: director Peter Hyams' 2010 (1984) (from a 1982 published adaptation titled 2010: odyssey two by Clarke). Other Clarke writings are potential film installments: 2061: odyssey three and 3001: final odyssey. A primeval ape man makes a breakthrough - becoming endowed with intelligence after experiencing a mysterious black monolith. Eons later, a similar monolith is discovered on the lunar surface in the 21st century, sending its signals to Jupiter. A futuristic, 18-month journey to Jupiter. A mystical experience in another time and dimension. A group of apes scratches and chatters in groups around a slowly diminishing watering hole. A rival, warring band of ape competitors approaches the watering hole, led by an almost-upright, tall and bright man-ape [named Moonwatcher in Arthur Clarke's novel] (Daniel Richter). By shrieking, they scare away the other apes from the water and aggressively establish dominance and territoriality. During the first night, a leopard with glowing eyes guards the carcass of a fallen zebra in the moonlight. The band of vegetarian man-apes huddles protectively together in their cramped den for comfort and support - living and sleeping in fear. In the first light of the prehistoric dawn on the second day, a tall, black, rectangular monolithic slab (THE FIRST MONOLITH), with an eerie humming sound - symbolic of the religious/spiritual unknown - materializes in the midst of their den. The massive artificial monolith, in contrast to its natural surroundings, stands in a shallow depression in the rocks where the man-apes gather around a water hole. [In Arthur Clarke's novel, the mysterious monolithic stone slab is a technological machine belonging to aliens in space, one of hundreds of such monoliths sent to Earth to test, teach and transform the apes into higher-order, intelligent beings.] The unusual, out-of-place object with straight-edges causes them to be alarmed and they react nervously. But then they approach it cautiously, drawn to its color, form, and smooth surface. The leader of the clan of man-apes is the first to reach out fearfully and hypnotically for the black object. [The image of 'reaching out' with an extended finger was directly borrowed by Kubrick from the famous painting found in Michelangelo's Sistine Chapel artwork -- of Man extending his finger to touch God's hand. The same imagery was utilized by Spielberg for his film E.T. : the Extra-Terrestrial (1982). Touching the Monolith approximates the Biblical equivalent of eating the forbidden fruit of Knowledge.] His boldness encourages the rest of the group to gather around. In a mute, primitive, but poetic moment, they herd around it and huddle by it, just as another celestial alignment or configuration occurs. With the mysterious monolith in the foreground, the glowing Sun rises over the black slab, directly beneath the crescent of the Moon. Late that afternoon (now with no monolith in sight), the leader man-ape is foraging for food. He plays with and contemplates one of the ravaged bones from an antelope skeleton. (There are many bones lying around on the landscape, a symbol of ever-present death.) A quick, almost-subliminal shot of the celestial alignment with the monolith is flashed on the screen - indicating that it will inspire a new idea or cause what is to happen [the discovery that the bone can function as a weapon]. In a slow-motion sequence - accompanied by the slowly-building tone of Strauss's Also Sprach Zarathustra - he picks up an animal bone and uses it to smash at and shatter the skeleton, first tentatively and then more vigorously. In a slow-motion closeup, his hairy fist grasps the skeleton bone over his head as he brings it down forcefully like a cudgel. As he orgiastically smashes and pulverizes parts of the skeleton on the ground, the soundtrack bursts forth in an ecstatic, jubilant climax. In one brilliant inter-cut image, a tapir falls to the ground - the vegetarian man-ape will be able to hunt for food and kill a tapir with his new utilitarian tool. No longer vegetarian after the breakthrough, the man-ape becomes carnivorous, squatting while eating a raw piece of tapir flesh in his hands. The rest of the clan share in the meat of the fresh kill later that afternoon and evening. [Somehow, the monolith has been presented as a gift to mysteriously assist the man-ape in his transition to a higher order (or lower order depending upon one's interpretation) with an ability to reason and the power to use tools (such as bones) - for murder.] The man-ape is on the verge of intelligence - the beginning of steps toward humanity as he learns to use skeleton bones as tools - extending his reach. The sun sets. No sub-title separates the "Dawn of Man" segment from the Lunar Journey segment - a jump-cut of four million years. [Does this omission of a subtitle for this segment indicate that man in both eras - the Australopithecine and Space-Age Man - is essentially the same aggressive creature with savage impulses who has successfully survived in another hostile environment?] In a great transitionary, associative image to the next segment many eons later, the tossed bone (tool/weapon) instantly rotates and dissolves into a white, orbiting space satellite from Earth - a technological instrument, tool, weapon (orbiting nuclear platform) or machine from another era that was ultimately derived from the first tool-weapon. The toss of the ape-man's bone is metaphoric for a lift-off from Earth toward the Moon, and for the tremendous technological advances that have occurred in the interim. It is four million years later - in the year 2000 [possibly in homage to Fritz Lang's German film Metropolis (1927) that was set in the futuristic year of 2000]. As the Earth drifts by, the camera's perspective is from somewhere between Earth and the Moon. Two different kinds of satellites (one slightly rectangular, the other cylindrical) float by, circling around the globe of Earth. A winged, arrow-shaped spaceship, the Pan American, dart-like space shuttle Orion [a phallic symbol or representation of "sperm"], soars from Earth through space toward the Moon, bound first for Space Station 5 - a wheel-shaped way-station for passengers traveling on to the lunar surface. [By the year 2000, Pan Am had already been bankrupt for almost ten years - since 1991.] Images of the giant circular space station revolving and orbiting in space are accompanied by the lyrical Blue Danube Waltz by Johann Strauss. The pace is deliberately slow, emphasizing the vast enormous vistas and the harmonious order of space. "Here you are, sir. Main Level, please." The doorlock of the airlock opens and Dr. Floyd enters the space station, named the Orbiter Hilton, provided with an artificial gravity. In the customs/documentation area, he is greeted with small talk by another attendant, and then met by Mr. Miller of Station Security. One formality to be executed is a Voice Print Identification test to verify his identity. He must wait an hour and ten minutes in the passenger lounge until the next leg of his journey. He hears a loudspeaker announce: "A blue lady's cashmere sweater has been found in the restroom. It can be claimed at the manager's desk." American corporate logos - Hilton, Howard Johnson's Restaurant, and Bell phone signs are visible in the long entryway. He calls his home (many thousands of miles away) on a Bell Picturephone and speaks to his daughter Squirt (director Kubrick's daughter Vivian). Floyd learns that his wife is out and that Squirt's caretaker is also unavailable. He ignores the spectacular sight of the rotating Earth over his left side while he gives her a brief Happy Birthday wish. Floyd expresses his regrets at not being able to be present at her party - he is literally and figuratively alienated from her. In the bright-white passenger lounge area while seated on magenta-colored armchairs - a standardized and sterile waiting area amidst the advanced technology - Dr. Floyd speaks cordially with some Soviet scientists, including lead scientist Elena (Margaret Tyzack) and Smyslov (Leonard Rossiter). They are on their way back from the Russian sector of the moon after spending "three months calibrating the new antenna." The conversation turns icy when Dr. Floyd is asked about the "odd things" that are happening at his destination, the American moon-base on the moon crater of Clavius, and why it has been out of phone communication for 10 days. The Russians are determinedly inquisitive and ask about the leaked rumor that a "serious epidemic" of unknown origin has broken out there and may spread. [The leak about an epidemic was deliberately released to cover up the real reason.] Concealing and evading the reason for his top-secret mission, Dr. Floyd deliberately declines to answer: "I'm really not at liberty to discuss this." He excuses himself to continue on his journey. To keep the monolith an absolute secret with a news blackout, an alternative "cover story" has been created and circulated about a possible epidemic at the base. The government fears any leak of the discovery may cause anxious panic or "cultural shock and social disorientation" among the families of Clavius personnel. During the banal conference, he is asked only one question from the audience - how much longer the false cover story must be maintained. His answer is again deliberately and bureaucratically vague. While eating processed, cellophane-wrapped sandwiches, Dr. Floyd and some of the other Clavius base personnel, Halvorsen (Robert Beatty) and Michaels (Sean Sullivan), jet out in a "moon bus" to the Tycho excavation site where the monolith is located (THE SECOND MONOLITH). On the way, they are bathed by the bluish, magical light of the interior of the bus, Floyd is complimented on his excellent speech at the briefing, cleverly revealing very little. Now that they can speak freely, he is told that the monolith was first inaccurately thought to be an outcropping of rock. A rectangular area around the monolith was excavated out to see if it was only the "upper part of some buried structure." One thing is certain - it was "deliberately buried" four million years earlier. The eerie, humming sound of a hymn on the soundtrack [also heard by the man-apes around the earlier monolith] indicates their approach toward the magical object. After docking in the lunar dawn, they walk toward the monolith's location wearing spacesuits. They view the monolith, the transcendent discovery, from the lip of a giant, excavated pit, while a three-quarters Earth hangs just above the horizon. They walk down a ramp into the crater's pit where the monumental object is bathed in dazzling, brilliant light. Like the man-apes before him, Dr. Floyd is similarly awed and stirred by his first view of the alien form - it is a religious experience as the men worshipfully gaze at the altar where the monolith stands.